If someone questioned our sanity right now, I wouldn’t blame them. About a month ago, Jan and I began a serious home-improvement project. Fed up with carpet and linoleum that didn’t stand up to our frequent entertaining and furniture re-arranging, we opted for one of the most durable and low maintenance flooring surfaces we could find: porcelain tile. With the goal to replace all the floors in our house with beautiful 18”x18” tiles, we began in the living room/hallway/dining room, since all the other rooms in the house branched from that central axis. Gung-ho to complete the project ourselves, we delved right in, and since Jan had installed tile before and I’d installed laminate flooring, we had great confidence in our ability to get it done quickly and efficiently. The tiling was a lot more work than we’d anticipated, and a month into the project, it still feels like we’ve only just begun. We started with enthusiasm, but after working at our jobs all day, it was difficult to get motivated to come home only to do some seriously strenuous physical labor. In addition, as I’m sure many can relate, working harmoniously on a DIY project with your significant other is one of the biggest challenges a person can undertake. While well-meaning friends shared statistics in jest about DIY projects being a contributing factor in many a divorce, I started to wonder if there was more merit to the numbers than I’d previously thought. Choices, choices, choices. Tile, or relax? Spend the evenings and weekends happy and peaceful, or engaged in a heated debate over the “levelness” of one particular tile? The project didn’t always win out. With guests expected to help eat the corned beef, I knew we couldn’t welcome them into a halfway-tiled space they had to tiptoe over. The corned beef would make us finish, whether we wanted to or not. 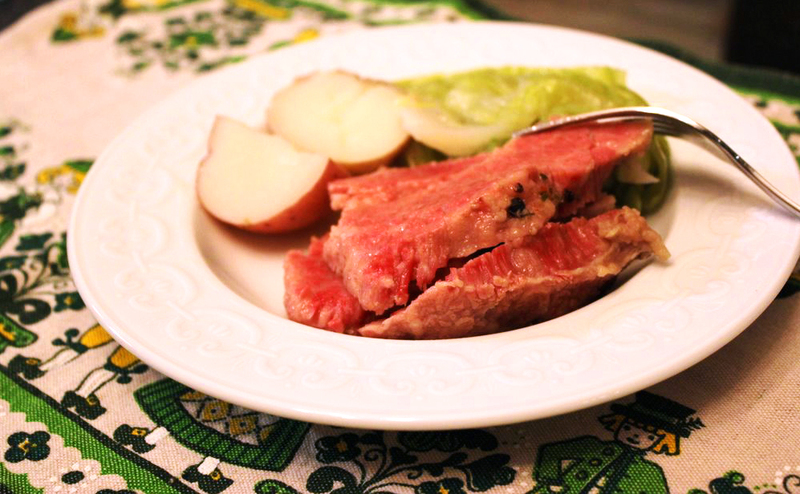 Corned beef and cabbage used to be one of those things I liked to have once a year, and once a year only. You wouldn’t catch me thinking, hmm, I’m craving corned beef and cabbage for dinner (like Jan does). But it might be one of those dishes that grow on you. I’m starting to think I could have it about twice a year and be OK.
Good thing too, since Jan was so excited to celebrate, he decided to do a test run of the corned beef and cabbage. Besides, it was a welcome break from tiling, and with our approaching deadline, we were actually making good progress. We opened up one of the packages and after trimming off as much fat as we could, cooked according to the package directions using the included spice packet. The general rule is to cook for one hour per pound, adding the cabbage and potatoes in the last half hour of cooking. 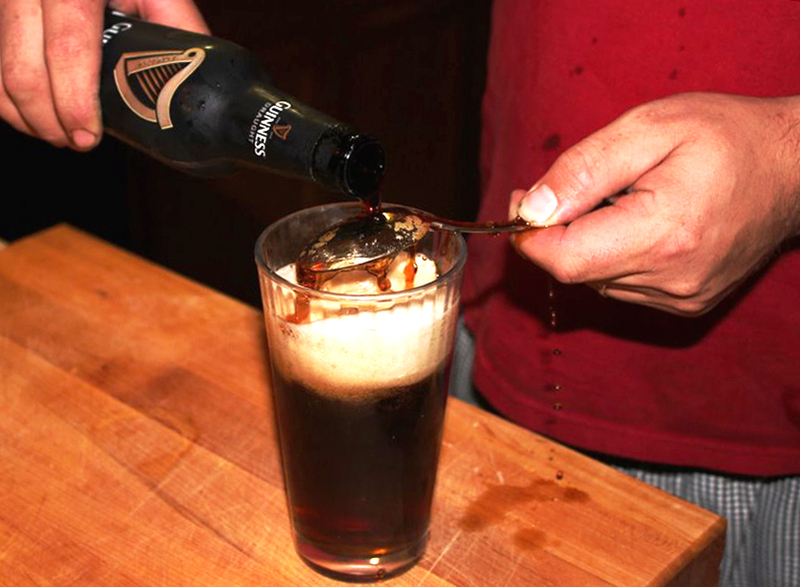 To wash it all down, we made Black and Tans, using Guinness Draught and Harp Lager. 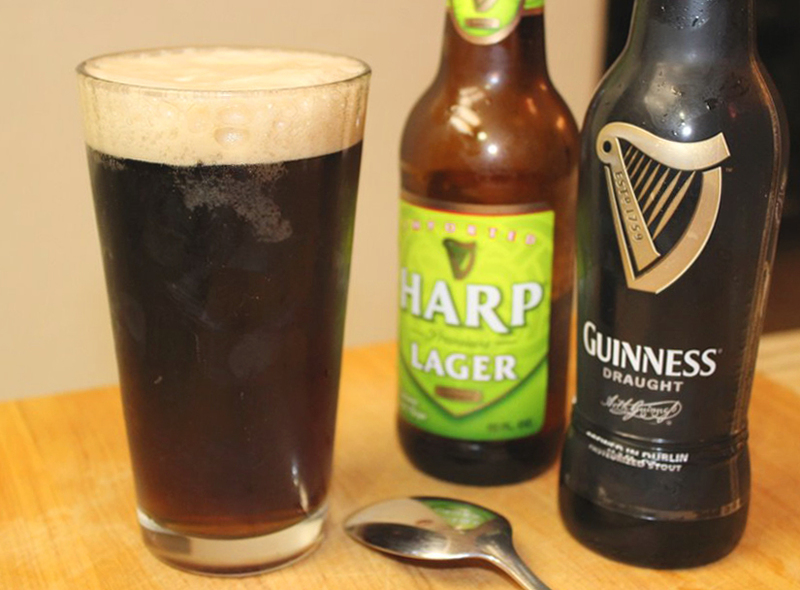 To prepare, we filled the glasses about 1/2 of the way with the light colored beer (Harp Lager), then poured the dark beer (Guinness Draught) over an upside-down spoon to fill the remainder of the glass without splashing and mixing the two layers. We sat together in the hallway (dining table moved there in order to tile the floor of the dining room), eating our corned beef, sipping the beer, and admiring our newly laid tile. “It looks so good, I think it was worth it,” Jan said. I gave him a sideways glance. “Worth the amount of work, and worth almost getting divorced,” he said with a smile. I had to agree with him. It did look great. In retrospect, it wasn’t that bad. Apparently we agreed on more things than we thought, including that the corned beef and cabbage was delicious. While we might have only completed a fraction of our big project, and probably won’t lay another tile for another six months, we’ve got everything we need: a completed dining room, a completed living room, and 31 pounds of corned beef. Now that looks absolutely amazing! You’ve inspired this Irish chick to hit the stores collecting corned beef of her very own! Sounds good 🙂 hope it turns out delicious! the ceramic floors will be worth it when you’re finished… we’ve dropped so many things on our kitchen tile, and there isn’t a scratch (let alone a crack) to show for it. The down-side is that a dropped wine glass will shatter entirely and send shards of glass shooting across the floor, every time. have fun..congrats on being fp’ed! Your home must be so popular for St Patrick’s day. The photographs look tempting. Now, I am looking forward to a similar meal (doubt it) today at a New York City restaurant. Thanks, the tiling is a lot of work, but worth it in the end. It may take a while to get started, but you’ll feel such a sense of pride knowing you did it yourself. Good luck with the project! It annoys Irish people so much to hear it call Patty’s Day!! That sounds really good. Thank you for sharing! Corned beef and cabbage, with a Black & Tan on the side. An excellent reward for a hard day’s work! Congrats! 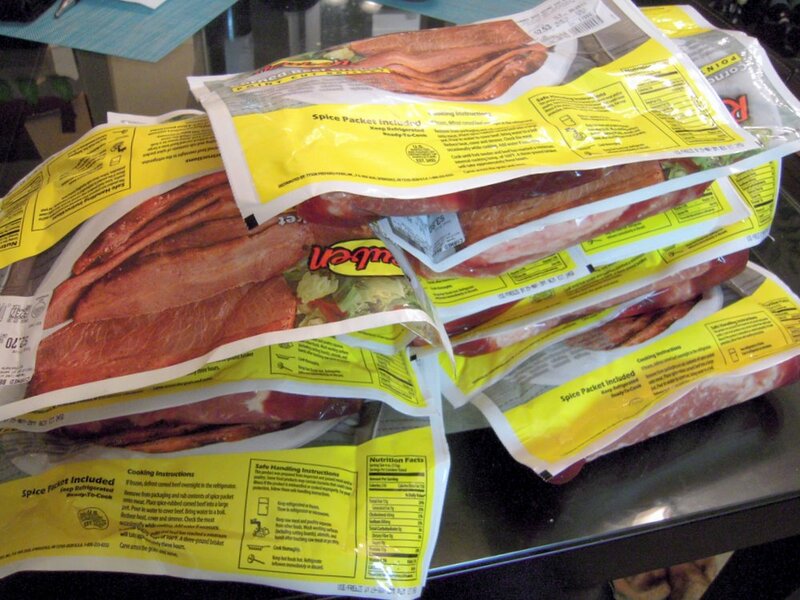 I am planning on cooking 12 or more pounds of corned beef myself, on Saturday. Still not sure how I am going to manage such a big batch in my small kitchen, but I am looking forward to the guests, and sharing a pint or two o’ Guinness! Slainte! I think we’ll probably have all the burners going on our stove, and a couple outside to manage all those pots of corned beef. It’s amazing how it looks like so much food, but it always gets eaten up so quickly. Good luck preparing your feast on Saturday as well! Deadlines always motivate you to finish things. Hope you have a great St. Patty’s Day party. It is St Patricks day or Paddys day. Irish people don’t like it being called St pattys day. The only time we like pattys is when they are in a hamburger. Food brings people together. You can tell so much about a culture by their food. That does sound pretty nice and delicious. Laying tile is hard and a long process… I wish you luck there. Nice post, excellent attitude at the end. Looks delicious, I just couldn’t cook it myself! I’ve tried to make homemade stuff at home and it always seems to turn out pretty bad. I don’t think I’ve had corned beef before, though I am part Irish, I haven’t had much of the food. I’m sure you could do it! Everything gets boiled together in one big pot, and when you buy corned beef around this time of year, it usually comes with all the spices you need included in a packet with the meat. Besides, if you’re drinking beer while you cook, it’s guaranteed to taste good by the time it’s done! Love corn beef and cabbage. But I want to see the floor!!!! We tile too. It’s a pain! But always worth it in the end. The scary part is the machine we rent to cut tile. That thing can take an eye out,an arm off or worse. Hate that thing. Haha, tiling and the tools needed to do it can definitely be dangerous. As far as a picture of the floor, everything’s still drying so we haven’t moved anything back into the rooms yet, but soon! Now that’s a meal of champions! Fabulous! Now that’s a long project. Let’s hope we’re not still tiling in 5 years, yikes! Thanks for the comment, and for letting me know about the use of “St. Patrick’s Day” verses any abbreviated version — I learn something new every day! This recipe looks great! Good luck! I can’t wait for my corned beef tomorrow! What? No pictures of the floor?? Dang. I gotta go and buy the ingredients,,,i want to try one so yummy yet simple and easy. Love the blog. I’ve seen the floor, it looks terrific… and I’ve tried the corned beef and cabbage, and yes, it’s tasty. When you’re in the edit box for each post, select all the text manually and choose black for the color. There is no way to change the setting for all posts at once so you’ll have to go through each post individually. Wearing a green shirt tomorrow! Beer is the drink not to be reckoned with. Well, Bravo on the housekeeping, but maximum respect on the “Black N Tans”, Corned beef,cabbage(sauerkraut is what I use) and lovely red potatoes!! The only thing you are missing is described in MY St. Patty’s Day post: Jameson’s! Kudos on being Luckily-charmed enough to get freshly pressed! Congratz on being on Freshly Pressed! The recipe looks scrumptious. Good luck on that! You can’t beat good floors! I’ve never had corned beef and cabbage. Corned Beef, potatoes and cabbage! Just love it! Growing up my father was a meat buyer for a local supermarket here in So Cal and would always bring home corned beef and cabbage. We never missed a St Patrick’s Day! Good stuff! Now you have me doing two things: craving corned beef , and NOT craving laying tile !! That was quite witty how you base your blog around meals when of course there are so many little events that transpire at this time. I enjoyed reading! Mmmmmm. 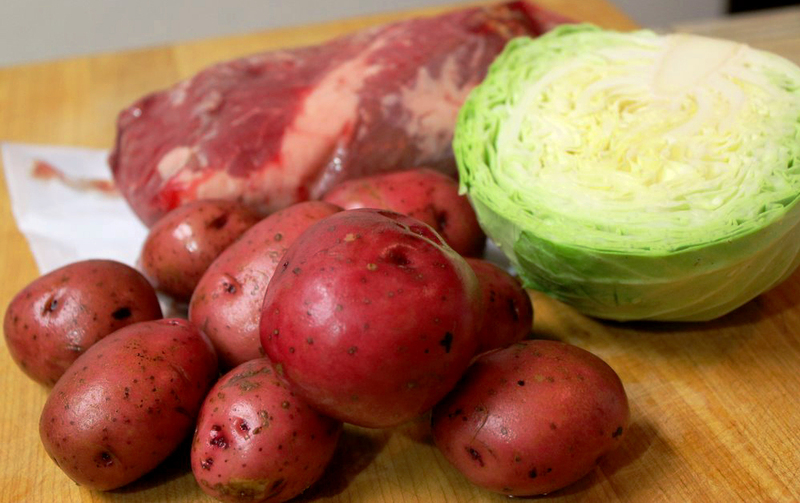 I have the corned beef,green cabbage and red potatoes ready to go. No Guinness. Killian’s Irish Red. OMG that looks delicious. I actually had someone tell me, an Irish lad, that corned beef sucked last night. They have no idea. All of the food looks DELICIOUS! !